This week I decided to share some inexpensive items to brighten your kitchen after Winter. You can update your kitchen quickly and inexpensively with just a few Kitchen Accessories for Spring. 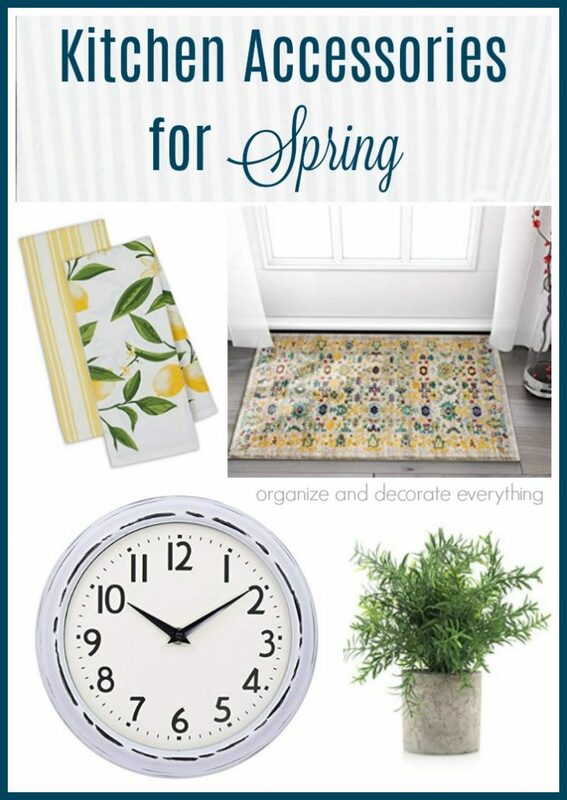 I’ve included affiliate links to help you find the specific decor items. I get a small commission if you purchase through my link but there is no added cost to you. Thank you for your support! I know we all like to make are homes feel beautiful and comfortable for our family and friends. But let’s get real, very few people can afford to buy new things and change all their home decor with every season. I have an awesome secret to share with you: I only add a couple new things to my home and move the other things around. No one knows and all the spaces feel refreshed. So pick and choose a couple Kitchen Accessories for Spring from this post to give your kitchen a quick refresh. 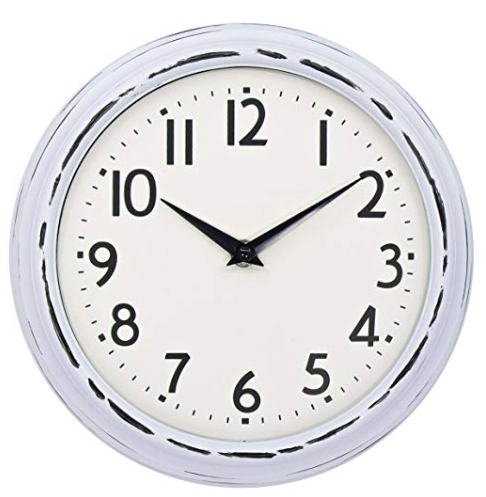 Let’s start with this simple Classic Clock. It’s the perfect size for a kitchen and is just decorative enough without being over powering. Under $20 and comes in a couple different colors. Slatted pallet wood signs are still a popular choice for wall art. 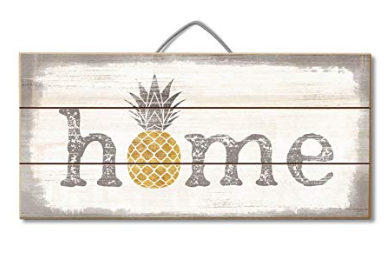 This Home Pineapple Sign is perfect in the kitchen for Spring and Summer. It has a great distressed look and is less than $20. 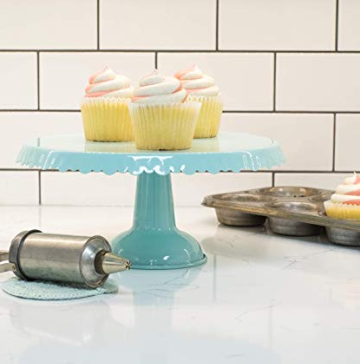 Cake Stands can be used for so many things in the kitchen. Besides displaying treats it can also hold plants and even dish soap and supplies at the side of the sink. I love pulling out my cake stands for little family celebrations and this Aqua Cake Stand would be a beautiful addition. It’s also under $20. I love being able to grab a pitcher to add faux or real flowers to. This time of year I usually go outside and snip a few newly budding branches. They’re free and they last for weeks. 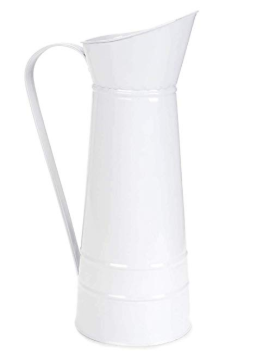 This White Metal Pitcher is probably my favorite thing to add to the kitchen if you don’t already have one. There’s something so fresh about lemons in the kitchen. You can almost smell them even though they’re fake. 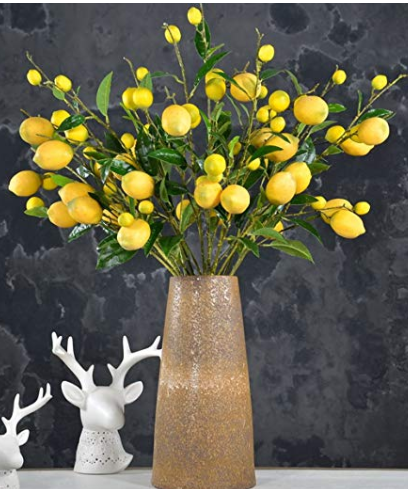 These Lemon Branches would look beautiful in the pitcher above. Package of two for under $24. Plants look great in a kitchen. 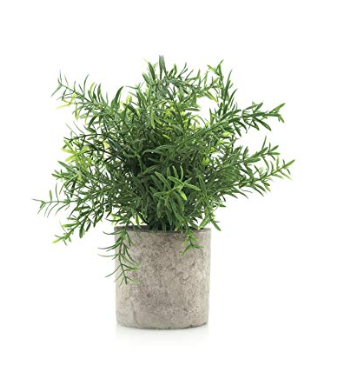 If you can’t grow a plant to save your life this Fake Green Plant is a great option. The pot is even looks awesome. I would probably buy a couple of them for under $14 each. When was the last time you bought new cooking utensils? 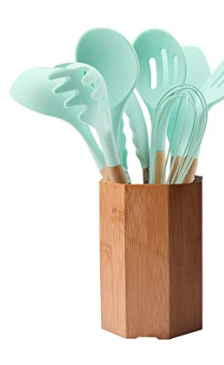 This Cooking Utensil Set comes with a wood holder so it will look great on the kitchen counter and also add a bit of color. I have a thing for bright, colorful patterned bowls. 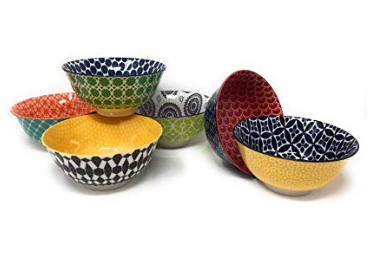 These patterned Ceramic Bowls would be a fun addition to your Spring and Summer parties. You can get all 6 for under $25. There’s something so fresh about stripes. It makes me think of staying in a beach house for the weekend. The tassels add a little extra fun and interest. 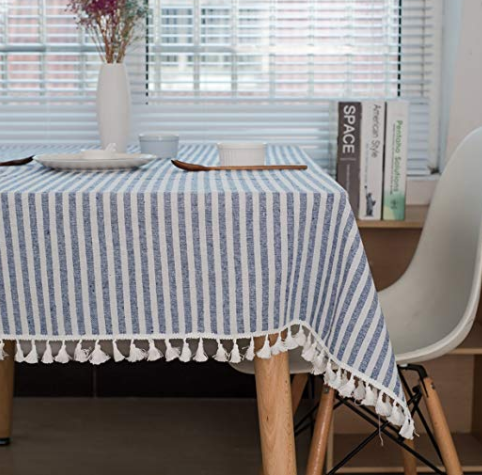 This Stripe Tassel Tablecloth is an easy refresh for your kitchen table and it’s under $25. We usually keep white cloth napkins available in a little basket in our kitchen. 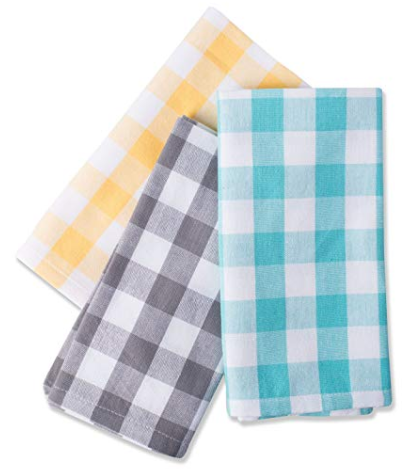 These over sized Check Napkins are a beautiful alternative for Spring and Summer. They’re under $17 for a pack of 6. Dish towels are a fast and easy way to add a little color and personality to your kitchen. 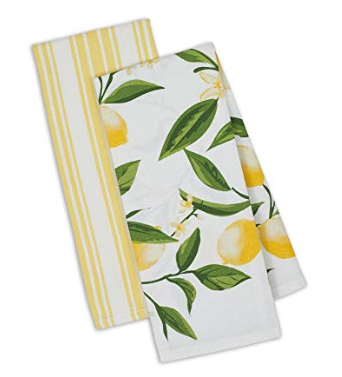 Pick these Lemon Bliss Dish Towels for under $15 for the set. They’re a great design and color for Spring. Don’t forget the floor. A new rug can change the whole look of a space. 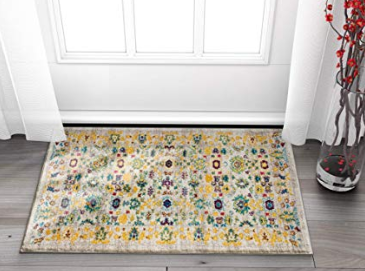 This Vintage Distressed Floral Persian rug has some beautiful Spring colors in it. Pick one or a couple of the colors to pull out and design your kitchen around. What are your new favorite Kitchen Accessories for Spring?